As hot summer days are becoming less bearable, more and more people started seeing camping as a means to get away from the heat and the city. It is a means of relaxation and enjoying free time without staying at home. Surely, there are several vital things that need to be packed such as a camping stove, cookware, blankets and several others. One thing that should not be missing is a lantern. Camping lanterns are an efficient source of light and because of their design, they can survive in harsh weather conditions. Now that LEDs are the way to go when it comes to efficiency, camping lanterns can offer many hours of use while still being lightweight and compact. 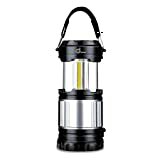 We picked 10 outdoor LED camping lantern models out of the hundreds available. Here is what we deemed as worth purchasing in our short top 10 best outdoor LED camping lantern list below. 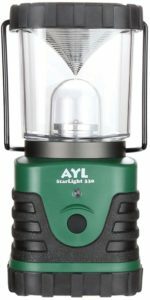 AYL Starlight DL790 lantern is a simple product with great utility. It was designed to withstand harsh conditions and for pretty much any type of activity including camping, hiking and other types of outdoor adventures. The model uses 3 D batteries for the lantern. It has a built-in flashlight that uses 3 AAA batteries. The lantern itself can run for about 21 hours on a new set of batteries which should be more than enough. Odoland COB LED lantern is one of the most inexpensive models in our list. 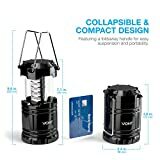 It is a great pick for the ones that do not want to spend too much and still get a practical camping lantern. It is fairly compact and well built. The model is a 2-in-1 lantern. 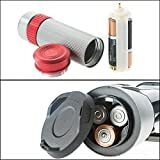 It also has a small flashlight that runs on separate batteries. It requires 3 AA batteries for the lantern which will keep it running for more than 10 hours. Also, it has 300 lumens of LED light. 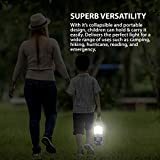 MalloMe camping LED lantern is a very practical device especially for the ones that like to spend time out in the great wilds. It has a collapsible design that makes it take less storage space and features a small handle to make it easier to carry around. The lantern runs on regular AAA batteries. It requires 3 AAA batteries that will provide a runtime of about 10 hours. The LED light provides a luminosity of 150 lumens and features 3 lights modes. Price per lantern is quite low. MalloMe offers them as a two pack and they included 12 AAA batteries. They are available in several different colors and have a sturdy construction. The handles are made from metal while the body is made from a sturdy plastic material. 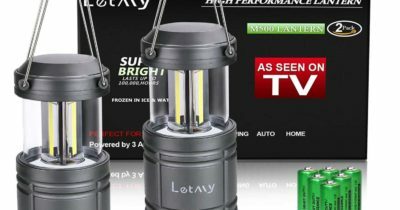 LETMY camping lantern is a great choice for the ones that are looking for a more reliable model. It uses premium grade LED lights that offer a lifespan of 100,000 hours. They offer a luminosity of 500 lumens, making it one of the brightest lanterns in our list. As far as practicality goes, the LED lantern was made to be collapsible. This makes it even smaller and easier to pack. The top has two handles to make it easier to carry or even hang it. Also, it has a magnetic base to make it stick on metal surfaces. The model works on 3 AA batteries. It includes a set of 6 batteries and has a runtime of about 12 hours. It also has a waterproof construction which aids it to survive even in the harshest weather conditions. 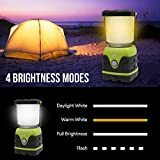 Lighting EVER portable LED camping lantern has a few extra perks that make it stand out when compared to other models. It is also a bit more expensive but manages to still be affordable. 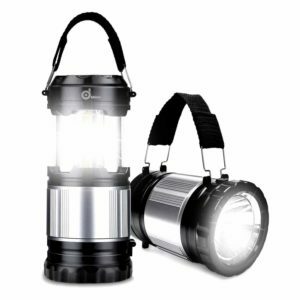 With a sturdy design and reliable LED lights, the lantern will be capable of handling all weather conditions. The lantern is waterproof meaning it will not get damaged by rain. Also, it is fairly small but it is not collapsible. The lantern requires 3 D batteries which are not included. A new set of batteries will offer 25 hours of continuous usage on low brightness and 12 on the highest brightness setting. In terms of luminosity, the lantern has 3 settings. The highest setting offers 1000 lumens while the lowest is set at 300 lumens. It has a small handle at the top and a silicone bottom to prevent it from leaving skid marks. 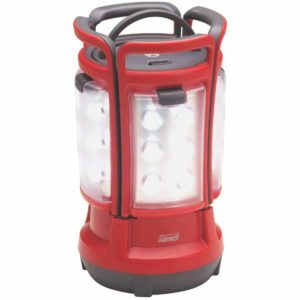 Coleman Quad LED lantern is a bit different when compared to other lanterns in our list. What sets it apart is the fact that it is made from 4 individual panels that can be detached from the lantern. Each panel can be used individually and offers a runtime of about 1.5 hours and a brightness of 190 lumens. 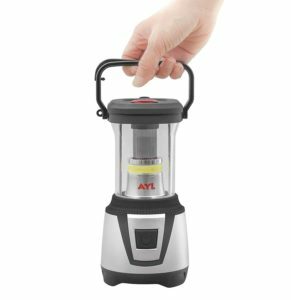 The entire lantern works with D batteries and offers 75 hours of continuous usage. No other lantern in our list has such a long runtime. The lantern is made to be water resistant. It weighs about 6.16 lbs. and comes with a small handle to make it easier to carry. The manufacturers offer a 5-year warranty for their product. 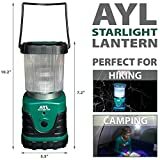 AYL StarLight LED lantern is a popular pick for most campers. It offers excellent build quality and a reasonable price tag. The lantern makes use of high quality LED lights that have a lifespan of 100,000 hours and a brightness of 600 lumens. The lantern requires 3 D batteries. A new set of batteries will provide about 6 days of continuous use on the low brightness setting. It has 2 brightness settings and a flashing strobe mode. In order to make it viable for camping, the manufacturers created the lantern with a water and shock resistant enclosure. It has a look at the bottom, so it can be secured onto the ground and a handle mounted at the top. 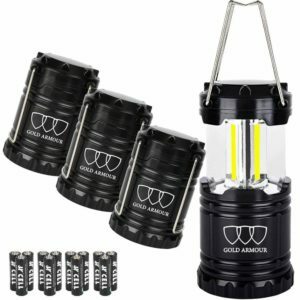 The Gold Armour LED camping lantern is one of the most inexpensive models in our list. It has a simple design with a collapsible top that makes it compact and easy to pack. It was made to be used for camping and survive even in harsh weather conditions. Even if most of the lantern is made from plastic, it is quite durable. It can survive drops and the waterproof design eliminates infiltrations that could damage it. The lantern is so well built that the manufacturers offer a 15-year warranty. In terms of brightness, the lantern emits 350 lumens. It has a metal handle on the top and a fairly lightweight construction. The model can be found in a pack of 4, offering excellent value for the money. Streamlight Siege compact LED lantern is indeed a smaller model that will prove to be just as practical as larger lanterns. It has powerful LED lights and a very rugged construction that allows it to work even in the rain. The lantern uses an LED array that is capable of an output of 540 lumens thus making it one of the brightest lanterns in our list. It also offers the possibility to select the brightness level by having 3 settings. Battery autonomy is decent, but it depends on the brightness setting. 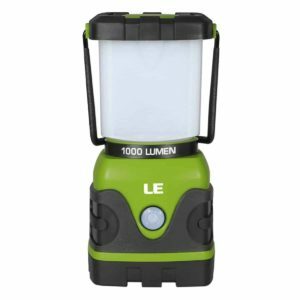 The lantern is available in several different shapes and sizes, including one model with a rechargeable internal battery. 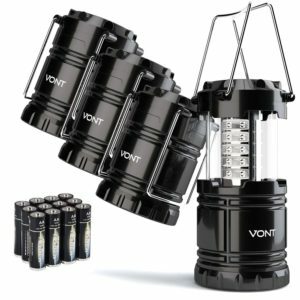 Vont LED camping lantern is by far the best-selling model in our list and for a good reason. 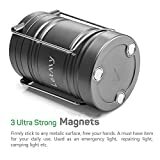 It is inexpensive as it comes as a pack of 4 and was specifically designed for camping. The lantern has a long-lasting construction and good battery life. The lantern uses high quality LED lights that offer a lifespan of at least 20,000 hours. Its enclosure is very robust, and it is completely waterproof. The lantern can be used in all types of weather conditions and will not get damaged by water. Like most other lanterns, the model is collapsible to make it take less space. It has two handles at the top and can even be suspended on a branch or tent-pole. 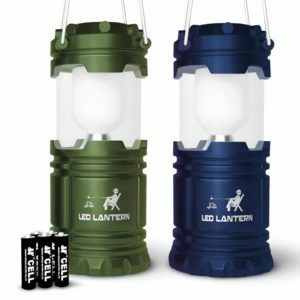 The lantern requires regular AA batteries and it actually includes a set of 12. Camping lanterns are an essential gadget for pretty much everyone. They are mainly advertised as being for camping, but they can have many uses. What sets them apart is how they build and their practicality. Since there are so many different camping lanterns to choose from, it can be a bit difficult to settle for a certain model. What is important is to look only for LED lanterns. LEDs greatly improved energy efficiency and how long a lantern can run on a fully charged set of batteries. There are some other things to look out for and we took the liberty to list them below. Collapsible design. Camping lanterns that have a collapsible design are practical when it comes to packing. However, they do not feel as sturdy as regular lanterns. It is a minor tradeoff that must be considered. Battery autonomy. 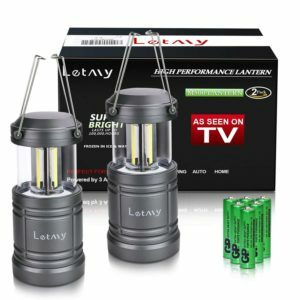 How long a lantern can work on a new set of batteries can vary from one model to another. Manufacturers usually state this quite clearly but many people forget to check this. Single lantern or multi-pack. The ones that need only one lantern should just get one. However, getting a pack of 2 or 4 gives a much better value. If more than one lantern is needed, it is better to keep an eye out for such deals rather order individual ones. Since the old incandescent light bulbs have been replaced by LEDs, the improved energy efficiency made camping lanterns much more practical. Campers do not need to pack all that many spare batteries which a major plus is. 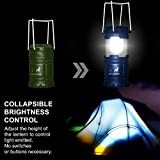 Adding the fact that LED camping lanterns are not that expensive, there is no excuse not to buy one. Camping lanterns should be the first thing that someone packs. 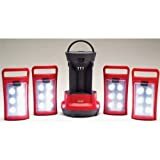 Our picks include only the most popular LED camping lanterns that offer a good deal and can work for at least 10 continuous hours before needing to replace the batteries.